Becca Thorne Illustration: New Hotplate! So, it's been chuffing cold recently (you might have noticed) and that means that my lino has been harder than granite to cut. Last year I had a log fire in the room I worked in, and rested my lino on the guard to warm it. 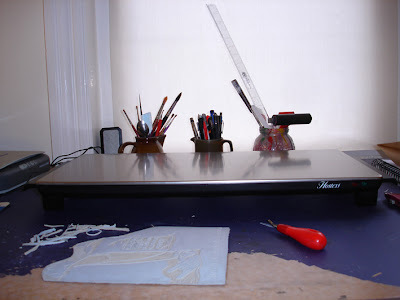 But then we went and moved, so I've been sitting on my lino and incubating it but, alas, even my bottom has been too cold recently. So i decided it was time for a hotplate. Unfortunately, printer's hotplates cost about £600 new, and I couldn't find any on ebay at all. What I did find though, was a heck of a lot of "Hostess" table top dish warmers, like you'd find in Chinese and Indian restaurants. They were going for around £45 including postage, so I got one! Hoorah! It's lovely and it stays warm for about an hour after 8 minutes charging (with the shortest cable in the world) and now my lino is soft and supple and warms my hands as I cut it! And, the best bit of all- the box tells me it's "the secret of effortless entertaining!" This hot plate is just what I'm looking for, Becca. May I ask where you purchased yours? I got it on Ebay. I just searched for 'hotplate' and there were loads of them at the time.